And here it is: The end of the EGU 2018. The final day is always a quite relaxed one. Many scientists have already left Vienna and so everything is a bit more relaxed. Anyway, for me the day was quite busy as there were many sessions of interest for me running in parallel. In the two morning sessions I spend my time in a session on climate archives and proxies, which was quite interesting. The topics were quite diverse and so it was a nice mix for the start. After lunch two sessions on sea-level were on the schedule. The first was on ice sheets during the Quaternary, which was mainly focused on the European Ice sheets during the last glacial maximum. The second one was on sea level from minutes to millennia, which was dominated by talks on the creation of sea level index points. And finally there was of course the poster session, as always some kind of a highlight of the day with many interesting discussions. So the EGU is over and it was again a very interesting conference. When I look back I have to say some things have changed this year. For examples I had the impressions that the queues for the free coffee were much longer. Also the poster boards, on which I had complained a lot earlier this week were new. Over the days, the problem with the hiding place of the poster tubes got certainly better, as most tables beside the boards got loose and it was possible to take them away to open the hiding place. For the whole week we had great weather and most stuff was well organised, but in my impression most sessions were too full. 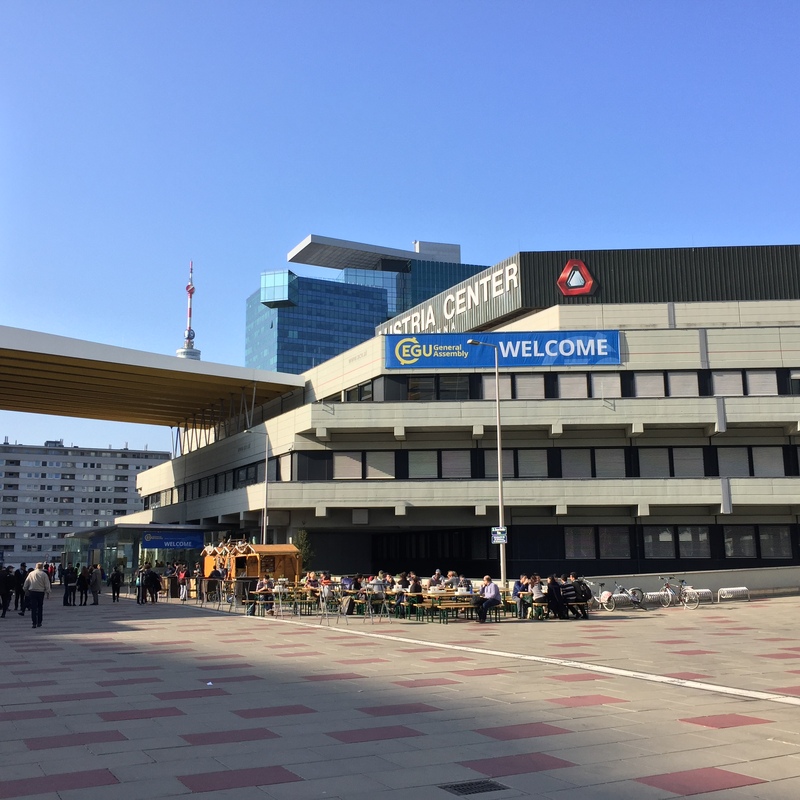 It seems that the Conference Centre in Vienna got to its limit and when the EGU should grow even more I doubt it is still the right place to host the event. Fourth day of the EGU this year and it was the day of my own presentation. But let’s start with the star of the day. The morning session I spend in a session on climate variability across different scales. They were interesting and quite variable in the topics, and as most sessions this year quite busy. After lunch I had my talk, which was quite misplaced in the session. As there was this year no verification session available, I had to look out for a session, which had this field as a side topic. It was connected to the data centre session and so was myself the only one who had a statistical method as a main topic and the other talks were purely software related. Nevertheless, the talk went alright. The final presentation session was for me then the medal talk of Tim Palmer, who gave a great overview on the development of probabilistic forecasts in the last century. The packed lecture hall got likewise a historical and a topical overview on these development, which led to the current ensemble systems. With the poster session at the end of the schedule the day ended. One day is left before the EGU 2018 will get to its end. Day three of the EGU 2018 in Vienna and today was the day for my poster. But beforehand an interesting day of presentation sessions was on the schedule. It started for me with a session on data assimilation in palaeo-climatology. As I come originally from meteorology, it is always interesting how the statistical methodology once developed for short term prediction applied onto completely different timescales. Next up was the GIA session, which included some sea-level talks. In the afternoon the first session was the one on post-processing, in which I also had my poster. Various statistical methodologies and workflows where presented to generate more gain from a dynamical (weather) forecast. Final presentation session was then on corals and their ability to give us information mainly of the ENSO in the past. The final session of the day was then the poster session. I had nice discussions on my topic of statistical-dynamical prediction and my take on why it works. Tomorrow will be the day of my talk, where I will present an alternative to the common used ACC and RMSE. Second day at the EGU and the weather is slowly declining. Before my contributions start tomorrow, today was the last intermediate day of the conference for me. It started with some palaeo-climatology and the numerical handling of this complicate field. Afterwards I paid a visit to the El Niño-Session, which offers always interesting insights to a very interdisciplinary field. 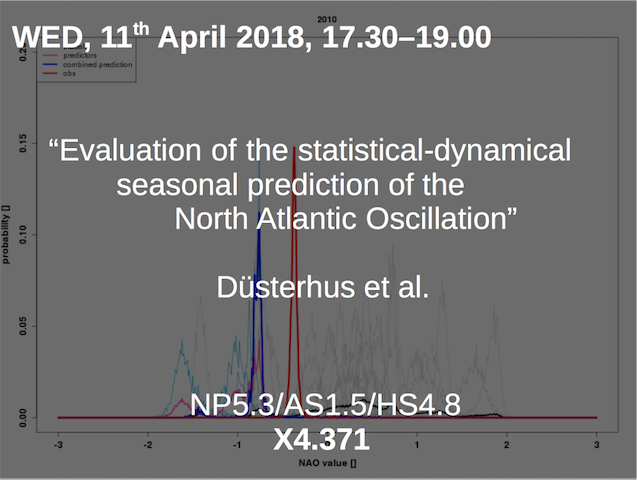 After lunch one of my main sessions this week was on the list, the sub-seasonal to decadal prediction. It covered various approaches to the three main time frames of prediction. New analysis techniques and new modelling approaches lead to quite a variable schedule. The last session was for me the first PICO session this year. The last I visited four years ago, was not this ideal, but they are now much more professionally organised. The screens are still too crowded from my perspective, but for certain topics it can work. The topic I tried today was Econometrics, the application of economical methodologies in climate science. It was a good choice to have to in PICO, because the main idea was to bring people to discuss things. So it was alright and I hope the presenters took something with them. Finally I enjoyed the discussions in the poster session. My personal topic of the day were the new poster walls. They are out of wood and yesterday I complained that it is not possible anymore to hide the poster tubes in the constructions as it was possible with the old ones. Problematic is also that the fixing tapes do not really stick well on the boards, so that the posters fall of very easily. So let’s see what my own poster session will bring tomorrow. I will be in X4 and present some new insights into our subsampling approach. And here we go! Another EGU has started today, all in all my fifth. It is always nice to spend some days in Vienna at the start of spring, so also this year the Austrian capital is offering us some sun for the start. Again I took the night train to Vienna, this time with a massive delay (5 hours). After the reception last night the conference really started today with the first sessions. I started with an interesting time series analysis session. The talks switched a bit through the topics, some quite mathematical, some very detailed in their methodology. Next stop was the big data and machine learning session, which was really busy. Much too many scientists wanted to get in, which is understandable how these topics are hyped currently. After lunch it was time for the sea level sessions with great talks. As this is still a topic of much interest for me I always enjoy an interesting session on that topic. The last presentation session of the day was for me the one on dynamical extremes, before the day was closed with the poster session. So all in all a quite statistical day at the start, the next day will certainly look a bit different. 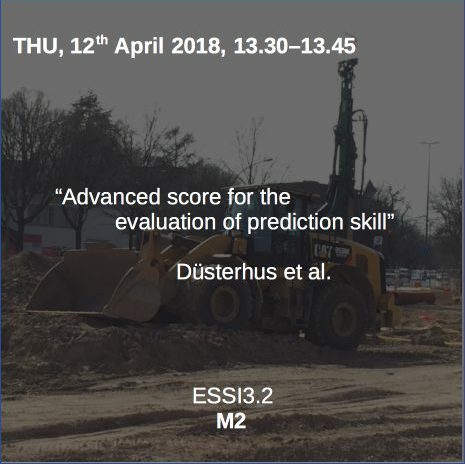 My contributions will come up on Wednesday with a poster and on Thursday with a talk, also both times quite statistical topics, but more on that closer to the mid of the week.